Peter Vermeersch, professor at the University of Louvain and researcher at the Institute for International and European Politics (IIEB), will hold the inaugural lecture. Brussels, June 1, 2018 – The European Observatory on Memories (EUROM) of the University of Barcelona and the House of European History (HEH) organize a joint conference in Brussels to discuss the role of the policies of the past for the democratic improvement of European societies. 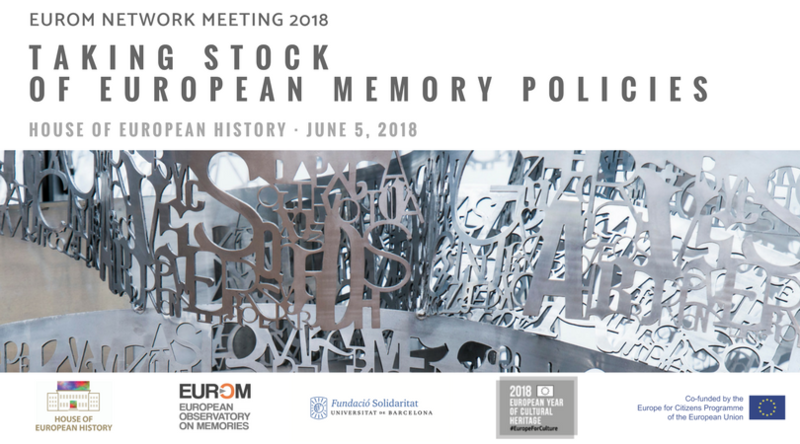 The meeting is open to the public and will take place on June 5, 2018, at the House of European History, bringing together academicians, representatives of organizations and trans-European networks of memory, and those responsible for memory policies at a European level. The meeting also aims to highlight the work developed by active players in the field of memory. The assistance is free, but prior registration is required. The event will begin at 9 a.m. with a visit to the permanent exhibition of the House of European History, guided by Martí Grau, comissioner at the HEH. It will be followed by a welcome session at 11 a.m. with the participation of Constanze Itzel, Head of Unit, House of Europan History, and Jordi Guixé, director of EUROM. The opening keynote, titled “A broader view on politics of memory”, will be delivered by Peter Vermeersch, professor at the University of Louvain and senior researcher at the Institute for International and European Politics (IIEB). The first round table will be formed by representatives of the European Commission and is scheduled to begin at 11,45 a.m. The debate will revolve around the challenges of the Europe for Citizens Program. Linked to the Executive Agency of Education, Audiovisual and Culture (EACEA), the program is one of the entities responsible for the financing of memory projects at European level. The debate will include the contributions of Pavel Tychtl, Police officer at the DG Home, European Commission, and Gilles Pelayo, Head of Unit of the Europe for Citizens Program (EACEA). The afternoon session will begin at 2.30 pm with the contribution of Michael Cramer, Member of the European Parliament (Green / AEP), who will analyze the trans-European memorial heritage practices through the “The Iron Curtain Trail” project. His speech will be followed by a roundtable with Members of the European Parliament. Starting at 3.30 pm. It will be chaired by MEP Miguel Urbán Crespo (GUE-NGL), featuring the participation of the MEPs Ana Maria Gomes, Izaskun Bilbao Barandica, and Ana Miranda Paz, members of the Transnational Group of Historical Memory of the European Parliament. The final roundtable will begin at 5,00 pm and will present the best practices developed by memory projects and networks in Europe. Moderated by Anna Cozzoli, Head of Sector, Europe for Citizens Program (EACEA), the table aims to present the civil society’s expectations for the future of memory policies in Europe. It will count with the contributions of the representatives of the European Memo Observatory (EUROM), Memorial de la Shoah, European Network Remembrance and Solidarity (ENRS), and The Beit Project. The meeting will conclude with observations and proposals at 6:30 p.m.